Posted in: 1 Pageant Pages, 2 Shout-out-Looks. Tagged: Gwen Ruais, Linden Suites, Miss World Philippines 2011, Miss World Philippines 2015. 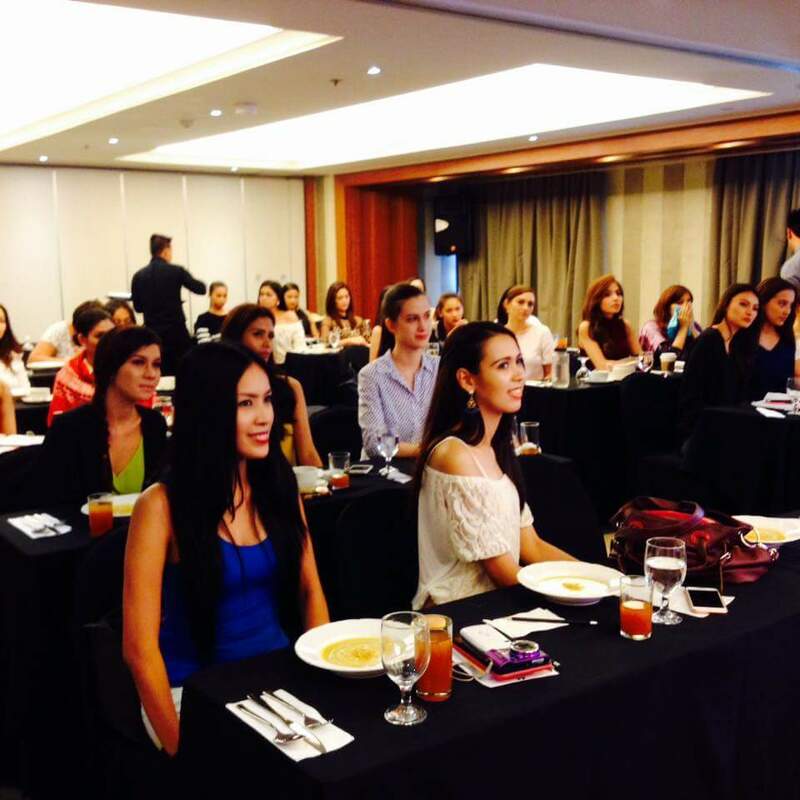 Just very recently, the twenty-seven (27) Official Candidates of Miss World Philippines 2015 got their first taste of the competition’s tailor-made trainings. Miss World Philippines 2011 and Miss World 2011 1st Runner-Up Gwen Ruais conducted a Question & Answer workshop at the Linden Suites where everyone intently listened to the speaker who has first-hand experience of how this part is being done during actual Miss World competitions. The insights they got are pretty valuable, I reckon. Gwen was very generous in giving the ladies precious tips on how to express themselves according to the exacting preference of the Miss World Organization. At the end of the activity, they all had a group shot (Photo below) with Gwen for a successful holding of the afternoon seminar. Posted in: 2 Shout-out-Looks. Tagged: Ariella Arida, Beauty Queen Secrets, Gwen Ruais, Miss Universe Philippines 2013, Miss World Philippines 2011. For her website “Beauty Queen Secrets“, Miss World 2011 1st Runner-up Gwen Ruais jumped at the chance to get down and cozy with Miss Universe 2013 3rd Runner-up Ariella Arida – all 14.27 minutes of it. Watch their one-on-one and you’ll see how much good time they spent talking to each other, while revealing Ara’s secret. Posted in: 1 Pageant Pages, 2 Shout-out-Looks. Tagged: Beauty Queen Secrets, Gwen Ruais, John Cuay, Miss World Philippines 2011. 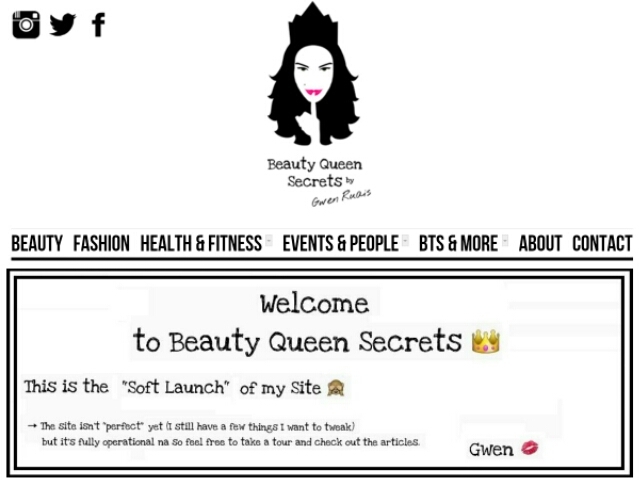 And Miss World Philippines 2011 and Miss World 2011 1st Runner-up Gwen Ruais has now opened her blogsite aptly taglined “Beauty Queen Secrets“. The “soft opening” is showing us another side of her personality. In it, there is initial focus on interviews with beauty queen-friends, health & fitness tips (with some help from trainer John Cuay) with a side serving of fashion/glam appearances she has recently done. I’m pretty sure she will eventually slide in to a blog niche that will make her site even more exciting in the months to come. Sunday Specials: Was it worth the risk? Posted in: 2 Shout-out-Looks. Tagged: Bb. Pilipinas 2013, Gabrielle Runnstrom, Jaysel Arrozal, Miss Philippines Earth 2012, Miss Resorts World Manila 2013, Miss World Philippines 2011, Rhea Nakpil, Samantha Purvor. Finishing 4th and 5th in Miss Resorts World Manila 2013 respectively, Samantha Purvor and Jaysel Arrozal smile despite the perceived disappointment within. It’s no secret that one of the major come-ons in joining Miss Resorts World Manila 2013 is the juicy cash prize (PhP500,000.00) going to the winner. And because of this, the official list of candidates this year contain four very familiar names – Samantha Purvor who was already Miss Water in Miss Philippines Earth 2012, Jaysel Arrozal who placed 4th Runner-Up in Miss World Philippines 2011 plus Rhea Nakpil & Gabrielle Runnstrom who were two of the Official Candidates in Bb. Pilipinas 2013. There were certainly risks they took in joining, but none more glaring than what both Samantha and Jaysel put themselves into. Having been top-tier finishers of big national pageants in the past, they stood losing more in the eyes of pageant followers (and even those who know them personally). And to be defeated by relative newbies made it extra disheartening in the end. I’m sure these ladies have already moved on from the surprisingly weak placements. I just feel slightly bad for them. Stephany and Gwendoline: Separated at birth? Posted in: 2 Shout-out-Looks. Tagged: Gwendoline Ruais, Miss Earth 2012, Miss Philippines Earth 2012, Miss World 2012, Miss World Philippines 2011, Stephany Stefanowitz. I am just in a bit of a playful mood this morning so I layered two separate photos of newly-crowned Miss Philippines Earth Stephany Stefanowitz and Miss World Philippines 2011 Gwendoline Ruais. They really have some striking semblance, no? I know that some of you would quip that Jinkee Pacquiao is the look-alike of Stephany, but Gwen is closer in terms of features. Anyways, how does Gwendoline feel that she is about to relinquish her crown next month and no clear aspirants for Miss World Philippines 2012 are in sight? With her 2nd-place performance in London last year, she must be hoping that her successor can equal if not exceed the same. Can the country make it twice in a row in the Top 3 of Miss World? Or has Julia Morley lost her shine in the Philippines and transferred her fondness to Indonesia – host of MW2013?